We saw so many dull fireworks photos from Fourth of July festivities last week, it's nice to see something that's truly unique. Photographer Jason Smith captured this perfectly timed (lucky?) shot of fireworks exploding over Rio Rancho, New Mexico just as a bolt of lightning flashed across the sky. Smith then shared the image on Reddit with the title "One of the best pictures I will ever take…" and it quickly went viral. While some might think the image has been Photoshopped, Smith says it was just a case of taking the right picture at the right time (i.e. just as a lightning storm moved into the area during a fireworks show). “I honestly was really lucky that the wind carried the storm over to my frame, and I was able to get quite a few other firework and lightning shots,” Smith told PetaPixel. 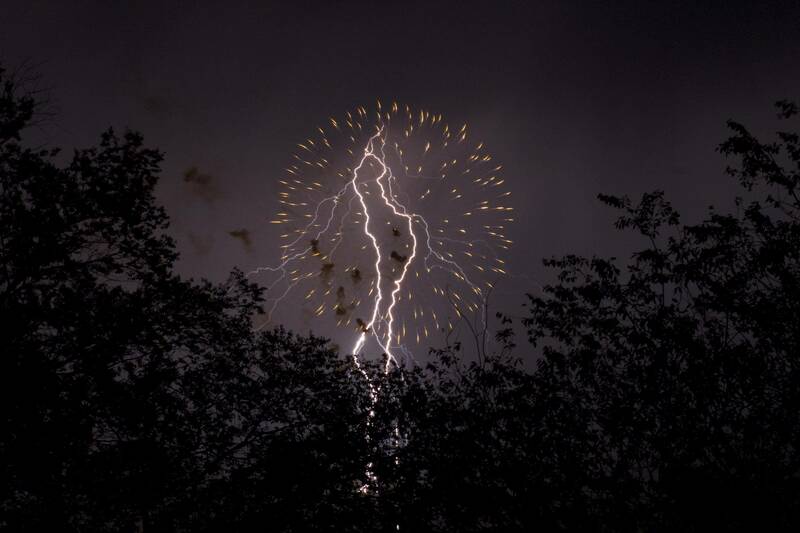 You can see more of Smith's fireworks images during the lightning storm on his Flickr page. Here's a full-resolution version of the spectacular image. For another unique spin on fireworks imagery, check out this Matrix-style, bullet time footage of fireworks being shot off in someone's backyard.